Building upon the remarkable success that they’ve had with their original television series, Netflix has recently made a conscious effort to balance their programming with more original movies by releasing new feature films on a weekly basis since the beginning of this year. They’ve had minor triumphs in the form of smaller budget fare like The Discovery and Win It All but David Michôd’s War Machine represents an aggressive play by Netflix to compete against Hollywood and their first-run releases by nabbing one of its biggest stars. It’s a shame, then, that the end product is far from the crowd-pleaser that it should (and could) have been and is instead a would-be satire that’s constantly at odds with what it wants to be and how it wants to convey its message. 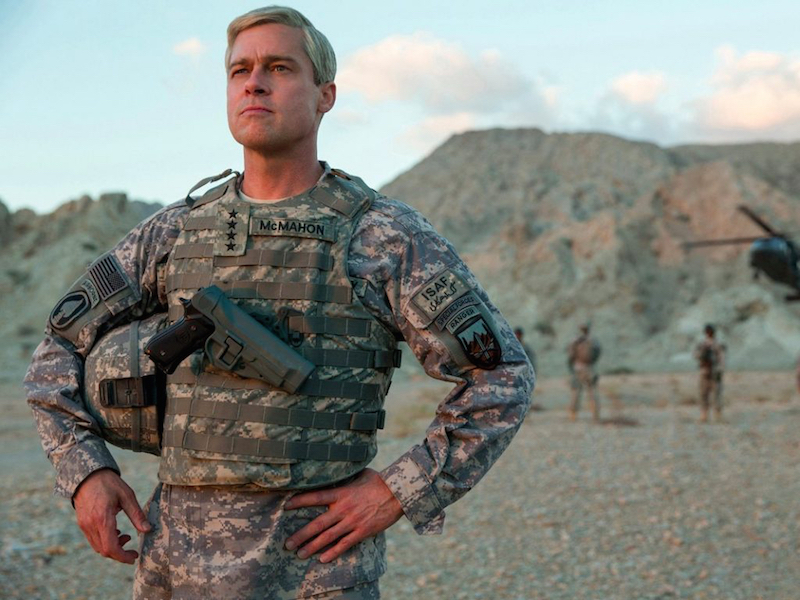 Brad Pitt stars as four-star General Glen McMahon (a loose variation on real-life General Stanley McChrystal), who is brought in by the Obama administration to resolve the increasingly tumultuous situation in Afghanistan by promoting counterinsurgency in vulnerable regions of the country. He is closely aided by a staff of men, including the hothead General Pulver (Anthony Michael Hall) and sleazy press advisor Matt Little (Topher Grace), who regard him as a living legend (their favorite nickname for him is “The Glenimal”) and would be happy walking to the ends of the earth if it meant pleasing him. The beats of their quixotic mission are framed in voiceover from a fictionalized Rolling Stone reporter who laments their circumstances and eventually enters the film as a tag along in McMahon’s military entourage. Of the many miscalculations present in War Machine, the most glaring is the mannered and terribly overdone lead performance by Pitt, which strikes a wrong chord from minute one and only has glimmers of redemption for the remainder of the time. With his cockeyed facial expression and his mouth fixated in an overbite that forms something of a permanent grimace, it seems Pitt wants McMahon to be a sort of larger-than-life buffoon type but it doesn’t jive with the level of respect that his staff seems to show him. The movie also can’t figure out how we’re supposed to feel about this character; if we’re intended to laugh at Pitt’s cartoonish mugging and quirky tics, then why does it so often try to make this a more dramatic personal story about McMahon’s struggles? The answer to that question, sadly, is brought forth from Michôd’s positively aimless direction, which casts the film in wildly varying lights from scene to scene and doesn’t have the clear vision to pull a satire like this off, much less give us a useful comedy or drama in the meantime. The cheeky opening monologue properly sets the stage for a satire on a certain type of hawkish military mentality but it loses its target early on and is rendered toothless by its lack of focus and by an absence of genuine comic payoffs. Michôd doesn’t know what kind of story he wants to tell us and he doesn’t have any sort of attitude towards the material that could have given the comedy the kind of edge that it needed or the drama the kind of poignancy that it could have discovered. Even more jarring are the misguided cameos from the likes of talented actors like Tilda Swinton, who is given a one-note role as a pestering new reporter, and Ben Kingsley, who is completely lost in his portrayal as the figurehead Afghanistan president Hamid Karzai. Other actors, like Meg Tilly as McMahon’s wife and Keith Stanfield (who gave another excellent performance earlier this year in Get Out) as a disillusioned Marine, make the most of their small roles and even steal the spotlight from Pitt in the scenes that they share with him. War Machine is about a mismanaged conflict with no clear strategy, so it’s perhaps fitting that the movie turned out to be such a mess but if Netflix wants to go to war with Hollywood, it will need to bring more to the battle than this.